Retired Gen. David Petraeus met with president-elect Donald Trump on Monday to discuss the possibility of serving as the next secretary of state. "I was with him for about an hour," Petraeus said after the meeting, according to a pool report. "[Trump] basically walked us around the world. Showed a great grasp of a variety of the challenges that are out there and some of the opportunities as well." He added: "Very good conversation and we'll see where it goes from here. We'll see where it goes from here." Former Director of the Central Intelligence Agency (DCIA) under President Barack Obama, Gen. David Petraeus interviewed for the documentary, 'The Spymasters,' about CIA Directors for CBS/Showtime. With producers Chris Whipple, Gedeon and Jules Naudet, New York, New York, July 22, 2015. Director, President and CEO of The Woodrow Wilson Center Hon. Jane Harman and Former Director, Central Intelligence Agency Gen. (Ret.) David H. Petraeus speak at the 2016 Concordia Summit - Day 1 at Grand Hyatt New York on September 19, 2016 in New York City. Robert DeNiro, Harvey Keitel and General David Petraeus attend the 2nd Annual Speyer Legacy School Access To Opportunity Initiative Benefit at Carnegie Hall on April 6, 2016 in New York City. Former CIA director David Petraeus speaks after leaving the Federal Courthouse in Charlotte, North Carolina, April 23, 2015. Petraeus was sentenced to two years of probation and ordered to pay a $100,000 fine after pleading guilty to mishandling classified information. Director of the Central Intelligence Agency General David Petraeus attends the Allen & Co Media Conference in Sun Valley, Idaho July 12, 2012. Petraeus resigned as CIA director on November 9, 2012 he publicly admitted to having engaged in an extramarital affair. Picture taken July 12, 2012. In this handout image provided by the International Security Assistance Force (ISAF), former Commander of International Security Assistance Force and U.S. Forces-Afghanistan; CIA Director Gen. Davis Petraeus shakes hands with biographer Paula Broadwell, co-author of 'All In: The Education of General David Petraeus' on July 13, 2011. CIA Director Gen. David Petraeus resigned from his post on November 9, 2012, citing an extra-marital affair with Paula Broadwell. The FBI began an investigation after it was tipped off by Jill Kelley, a long-time friend of the Petraeus family, who received threatening emails from Broadwell. Jill Kelley, General David Petraeus, Holly Petraeus, Jill Kelley and Scott Kelley (l.- r.) attending event in which Gen. Petraeus was presented with community service award at the home of Jill and Scott Kelley during summer of 2011. US General David Petraeus (2nd L) attends a meeting with German Chancellor Angela Merkel, German Defence Minister Karl Theodor zu Guttenberg and Afghan President Hamid Karsai (not in picture) during an unannounced visit to the German Army's base in the Afghan city of Masar-i-Sharif on December 18, 2010. US President Barack Obama walks off Air Force One upon landing for an unscheduled visit to Bagram Air Base in Afghanistan December 3, 2010, and is greeted by US commander in Afghanistan General David Petraeus and US Ambassador to Afghanistan Karl W. Eikenberry (behind). U.S Army General David Petraeus, commander of the Multi-National Force in Iraq, testifies before the Senate Foreign Relations Committee in Washington, D.C., U.S., on Tuesday, April 8, 2008. Petraeus said progress in Iraq is too "fragile and reversible'' to allow for U.S. troop levels to fall below about 140,000 earlier than September. US Army General David Petraeus, incoming commander of US Central Command and former commanding general of the Multi-National Force in Iraq, interacts with other guest riders after returning to the White House following a bicycle ride with US President George W. Bush, in Washington, October 11, 2008. U.S. Army General David Petraeus throws out the first pitch prior to Game 2 of Major League Baseball's World Series between the Tampa Bay Rays and Philadelphia Phillies in St. Petersburg, Florida, October 23, 2008. U.S. Senator Barack Obama (D-IL) listens as U.S. Army Gen. David H. Petraeus provides a situation update on Iraq to a congressional delegation in Baghdad, July 21, 2008. Obama and other members of the delegation met with Iraqi leaders and U.S. military commanders in a visit overshadowed by the question of when U.S. troops should go home. U.S. President George W. Bush speaks to reporters following a meeting on the war in Iraq at the White House in Washington October 5, 2005. Standing with Bush are the former commander of the multi-national security and transition command U.S. Army Major General David H. Petraeus (L) and U.S. Secretary of Defense Donald Rumsfeld. General David Petraeus, the three-star U.S. General charged with overseeing the transition of power from the Coalition military authorities to the Iraqis poses June 21, 2004 in Najaf, Iraq. U.S. Lt. General David Petraeus, commander of the 101st. Airborne Division shakes hands with an Iraqi Army soldier celebrating his graduation in Kirkush Military Training base, July 8, 2004. Columns of 720 soldiers of the newly U.S-trained Iraqi Army celebrated their graduation on Thursday as part of U.S initial plan of creating a new Iraqi army division numbering 12,000 troops within a year to replace 400,000-strong army dispended by the U.S led coalition authority after the fall of Baghdad on April 2003. Paul Bremer (L), the the U.S. administrator for Iraq listens to US Commander Maj. Gen. David Petraeus upon his arrival at Mosul airport in northern Iraq before a short helicopter tour of the city 18 May 2003. The U.S. administrator for Iraq, Paul Bremer, said on Sunday he was pushing ahead with setting up an Iraqi interim authority, denying media reports that Washington was suspending the transition process. In this handout photo from the U.S. Army, Maj. Gen. David H. Petraeus, commander of the 101st Airborne Division (Air Assault), speaks during the 716th Military Police Battalion during a assumption of command ceremony November 2, 2003 in Babylon, Iraq. Lt. Col. Ashton L. Hayes took command of the battalion after former commander Lt. Col. Kim S. Orlando was killed Oct. 16 in Karbala, Iraq. Major General David Petraeus, commander of the U.S. Army's 101st Airborne division meets with local Kurd and Arab leaders July 26, 2003 in the ethnically mixed town of Domiz, in northern Iraq. Petraeus was the guest of honor at a dinner hosted by the leaders and participated in a ribbon cutting ceremony for a new hospital clinic built with the aid of the U.S. Army there. David H. Petraeus got a diploma from the U.S. Military Academy and the boss's daughter as well. The cadet captain and assistant brigade adjutant, who comes from Cornwall-On-The-Hudson, New York, is to marry Holly Knowlton, daughter of West Point Superintendent Lt. General William Knowlton. The pool for the secretary of state job is thought to be narrowed down to two candidates — former New York City Mayor Rudy Giuliani and former Massachusetts Gov. Mitt Romney. But there's been infighting in the Trump camp lately about the two candidates. Top Trump adviser Kellyanne Conway has publicly raised concerns about Romney, questioning his foreign policy experience and noting that Trump supporters might feel "betrayed" by the selection of someone who was a vocal critic of Trump during the primaries. And some Republicans have shown concern about Giuliani's foreign business ties affecting his ability to win confirmation from Congress for the job. Petraeus has said that he would serve in a Trump administration if asked. A top official on Trump's transition team told Bloomberg that Petraeus has significant support in the Trump camp and that Trump is "inclined" to pick him. Trump himself tweeted after the meeting, saying he was "very impressed" with the general. The four-star general, however, doesn't exactly have a blemish-free resume. Petraeus resigned his post as CIA director in 2012 after his affair with his biographer Paula Broadwell was made public. And last year, he agreed to plead guilty to a misdemeanor charge for mishandling classified information. Petraeus allegedly gave Broadwell eight notebooks that he kept while he was the commander of coalition forces in Afghanistan. The notebooks contained everything from his daily schedule to classified information regarding identifies of covert officers, war strategy, intelligence capabilities, diplomatic discussions, quotes from high-level National Security Council meetings, and discussions with the president of the United States, according to court documents. He also apparently lied to FBI investigators about giving Broadwell classified information. 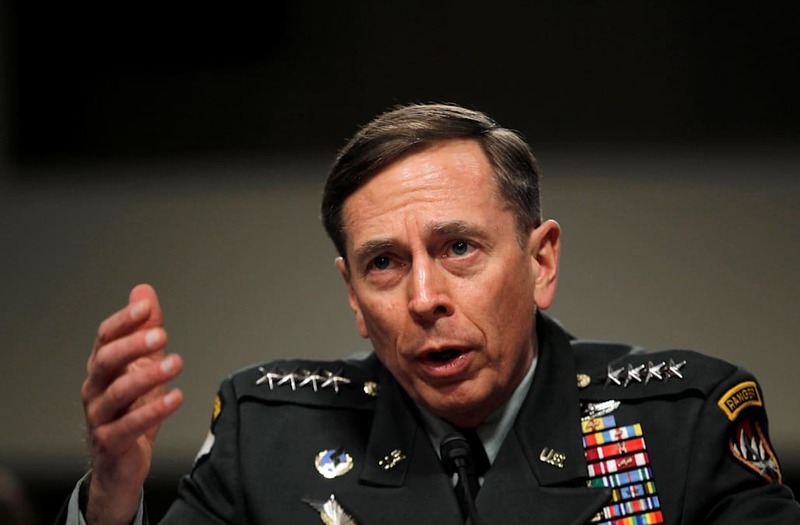 Before the scandal, Petraeus was one of the most famous and well-respected generals of his generation. He commanded forces in both Iraq and Afghanistan and rewrote the manual on counterinsurgency, a strategy that led to Al Qaeda being wiped out in Iraq (before it re-emerged as ISIS after the US pulled troops out of the country). Petraeus also oversaw the 2007 surge of US troops into Iraq, which was widely heralded as a success. After he left the CIA, Petraeus became chairman of the KKR Global Institute, a subsidiary of an investment firm that focuses on economic forecasts, public policy, and emerging markets.